With the twang of a steel guitar, the whine of a fiddle and the plunk of a banjo comes an instant association; the pick-up truck, the cowboy boots, the rolling hills, dusty fields, lonesome highways and the flag. For many, it has also come to signify conservatism, “traditional values,” American chauvinism, and even racism, bigotry and the Confederate flag. Although one wouldn’t realize it from listening to today’s pop Country radio stations, Country music has been anything but a right-wing soundtrack. To the contrary, the roots of Country lie firmly in resistance to capital, freedom from government interference, and in defense of the right of workers, poor farmers, and the dispossessed to live their lives in dignity. 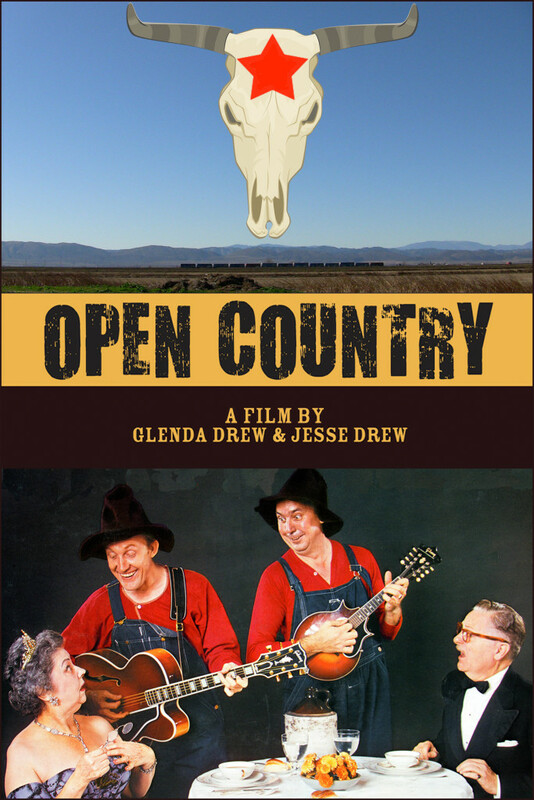 Open Country is an ongoing feature-length documentary project that challenges right-wing claims to Country music and returns it to its progressive working class roots. When we set out years ago to create this film, we imagined it would take a fairly traditional route. Wading through our first pile of books, we found it difficult to find any substantial challenges to conventional orthodoxy beyond the formulaic and rote biographies of famous Country stars, yet digging deeper into the nooks and crannies of history revealed promising veins of what we were looking for. We began interviewing people who could help us move the conventional framing of Country music beyond the God, guns and girls enthusiastically promoted by Nashville. Archie Green—historian, working-class activist and instigator of the American Folklife Center—invited us to sit down with him at his kitchen table. Hazel Dickens, whose Appalachian voice earned her a National Heritage Fellowship, allowed us to set up camera in her hotel room before her set at the Hardly Strictly Bluegrass Festival in San Francisco. Wobbly musician and troublemaker U. Utah Phillips invited us into his home to record what he knows about our subject. Gerald Haslam, author of Working Man Blues, and classmate of Merle Haggard from the Oiltown section of Bakersfield, California shared his perspectives. Pete Seeger contributed valuable stories as well, seated in front of his fireplace, banjo on his knee. All of these people and many more helped a new story of Country music emerge from under the shadow of Nashville. To illustrate our research and interviews we spent countless hours searching archival repositories, obscure collections, and the internet archive, as well as relying upon the blood, sweat and tears of San Francisco archivist and filmmaker Craig Baldwin. We created a monster as our research and storyline spread its tentacles in countless directions. Where did the musical instruments of Country come from? What about women in Country? What about the essential influence of African-American musicians? Of Tex-Mex? Of McCarthyism? Of media monopoly? Of the Vietnam War? Our materials grew to enormous proportions! And the pressure was on to deliver on some of our findings! It is hard for us as filmmakers to turn down invitations to present our film, even one that is unfinished and unruly. In that case we are left to haphazardly pull our materials together and make sense of it using our vocal chords and performative skills to pull it off. Thus, we ventured into several exhibitions not as an organized film but as an “editing on the fly” kind of project, a style that came very naturally, because as media teachers we are used to driving home points punctuated by film clips. To present Open Country we only asked how much time our “film” should take. When we walked into a venue, we would check out the crowd and decide then and there which clips would resonate the most with the audience. We “opened” in this way to a crowd of cowboy-hat wearing seniors before a Merle Haggard concert. We screened our live cinema project at Other Cinema at San Francisco, at a large museum crowd in Sacramento, and at a pub in Dublin, Ireland. But we still had so much material and so much to say, it was hard to trim it all down. In most of our screenings, we invited a local country music act to open for us, to drive home the “live” feeling of the event, and add to the “cabaret” feeling of the experience. Our Immersive and Participatory “Film Bar”. Conventions of film making and of film exhibition have always been evolving, but perhaps not to the extreme extent that they have in recent years. The development of digital technologies spurred new ideas about non-linear storytelling and audience interaction, while the ubiquity of downloading and smart-phone viewing drove new efforts to get people back into the theater, from IMAX to 3D to Surround Sound. Many of these efforts resulted in trendy and superficial gimmicks that fade out quickly from popularity. Still, the fact remains that cinema is a collective activity, experienced in a much deeper and meaningful way with a group of people in an immersive environment such as a large screen. As filmmakers, we promote that collective experience. We came to realize our Country music project has accumulated an enormous amount of material to be shared, that will not fit into a conventional film. We also appreciate that movie goers often like to watch a film and then retreat to a bar afterwards to have a drink and discuss the film. What if we combined all these things? Film Bar at first glance is a classic Country bar in the honky-tonk tradition. It is a walk-in film set, immersing the audience into the Country bar motif. 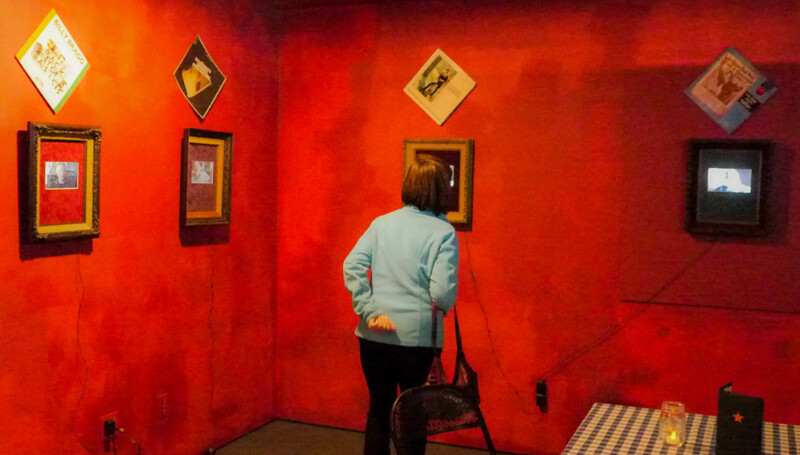 Darkly lit with colored lights, its walls are festooned with classic Country album covers, while artifacts like cows’ skulls and banjos emphasize the motif. Belly up to the bar, and park yourself in front of the large monitor mounted over the liquor bottles, that could be playing Loretta Lynn, Charlie Pride, Merle Haggard, or other country legends. 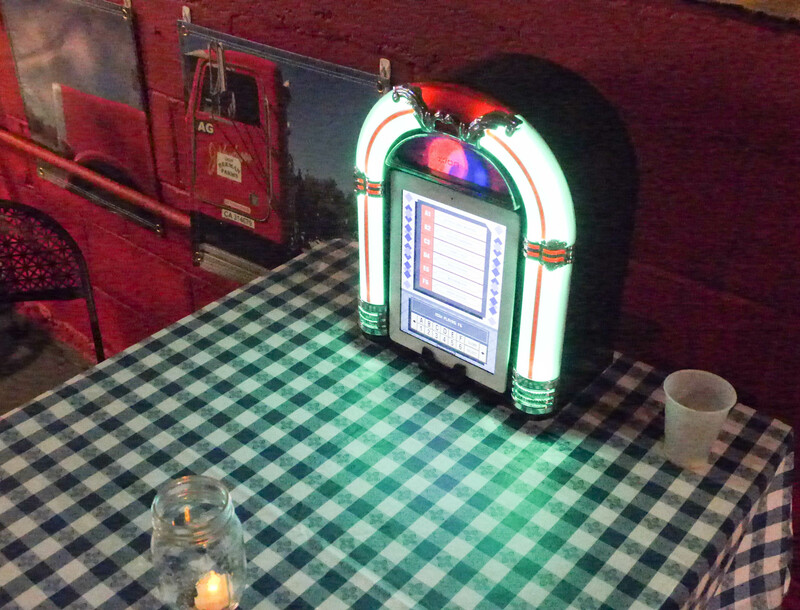 Glowing jukeboxes rest on the bar and on tables scattered around the room. Conventional jukebox interfaces allow the bar-goer to select clips of our film, that show up on the large monitor. “Menus” scattered around the tables and bar listed the film clip choices and the credits for the project. Thus, the film audience can select and watch clips of the film while ordering from the bar and socializing with the crowd. The bartenders serve drinks, (mostly root beer for all ages shows!) as well as act as live narrators for the film. 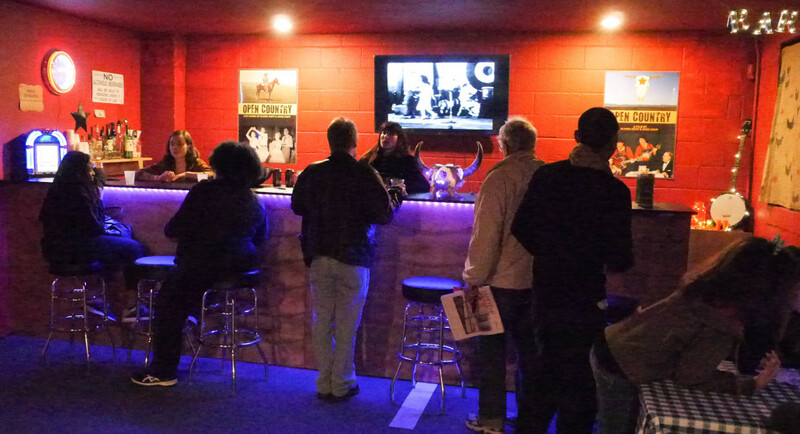 Film Bar was launched at Verge Center for the Arts in Sacramento and then built as part of the mammoth and highly successful Art Street installation in Sacramento. Art Street brought together more than 32,000 people in its one-month long run and thousands of people were introduced to Open Country, including many families and individuals who typically don’t go to art shows and would probably not go to a limited-run art house movie theater where Open Country would most likely be played. Visitors were engaged by the experience and many stayed a while to drink their rootbeer, play clips from the jukebox and reflect on their own experiences with Country music. Many returned with their friends! Film Bar demonstrated that there remain many new ways to bring cinema to large audiences in an immersive, fun and non-conventional way. Open Country will be released as a feature-length film at some point, but along the way we’ll be slinging drinks and swapping stories the same way bars have always functioned. University of California, Davis faculty Glenda Drew <gadrew@ucdavis.edu>, Professor of Design & Design Graduate Program Chair, and Jesse Drew <jdrew@ucdavis.edu>, Professor of Cinema and Digital Media, are long-time, down-home friends of Other Cinema.